Two Bradford County deputies fatally shoot a suspect Tuesday afternoon in the first deadly deputy-involved shooting in the county in nearly a decade. But, it’s a situation Bradford County Undersheriff Brad Smith says his deputies prepare for often. Devaughdre’ Delsha Rogers, 20, was shot and killed after he ran from a traffic stop in Starke. Sheriff Gordon Smith says Rogers was running with an AK-47 near where a summer camp was in session near the intersection of U.S. Highway 301 and State Road 16 when he was fatally shot. While the last fatal deputy-involved shooting in Bradford County was in 2009, it can happen anytime and anywhere, so deputies prepare for situations that could lead them to have to decide if they should shoot or not. In 2015, Bradford County Sheriff’s Department allowed the I-TEAM to take part in their training. 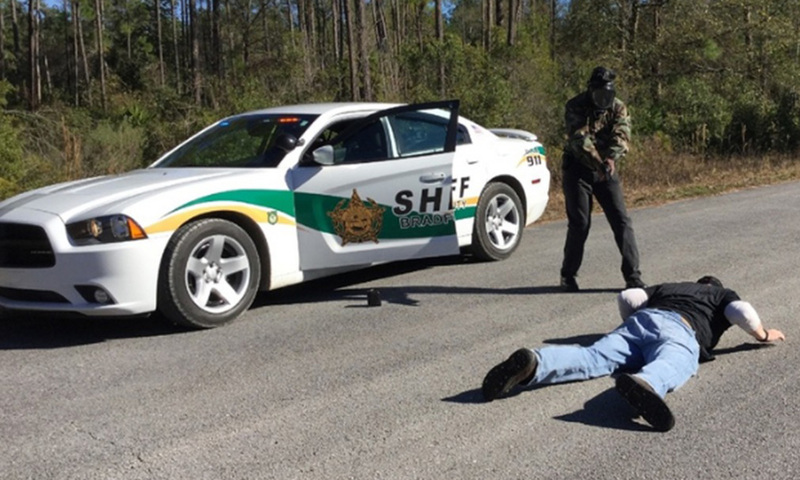 Instructors put deputies through realistic scenarios to see how they’ll react under pressure. The hope is they only fire their weapons when it’s absolutely necessary. Our original story three years ago came at a time when police shootings were some of the biggest national news stories and gave News4Jax an opportunity to show what it was like from an officer’s perspective. Sheriff’s instructors put us through the drills to show us how quickly these real-life scenarios can happen, and how it’s a life or death decision that deputies often have to make in a matter of seconds. The scenarios included a domestic dispute, a suspicious activity call, and a traffic stop. “You’re just going there to investigate and keep the peace,” explained Capt. George Konkel with the Bradford County Sheriff’s Office. Instructors used actual scenarios they’ve encountered before to test the deputies, News4Jax and former NAACP activist Rev. Larry O’Hara, who we brought with us to get his take. The deputies are taught to avoid shooting someone unless they feel their lives or the lives of others are in danger. “We never point this at anything other than a threat,” Lt. Kevin Mueller with the Bradford County Sheriff’s Office said about the firearm. No matter what kind of situation law enforcement may be responding to, any of them can be dangerous for both police and citizens. “Why are you stopping me? Why are you stopping me?” the driver asked during the traffic stop scenario. “Let me see your hands,” the deputy responded. During the 2015 training, deputies showed us how the decision to shoot must often be made in a split second. Only they can decide if the person they’re confronting is a threat or if they can get the situation under control peacefully. After getting to participate in the different scenarios with Bradford County deputies, Rev. O’Hara, who had been outspoken about police shootings in the past, said he saw things differently now that he’s walked in the shoes of law enforcement. “So now that you’ve had this experience, you’re gonna look at things a little differently?” the I-TEAM asked. “I will have to,” he answered. Some of the deputies involved in our 2015 training, did respond to Tuesday’s shooting, which the Florida Department of Law Enforcement is now investigating.